When companies need to seek financing while filing for bankruptcy, the legal issues involved can get tricky. 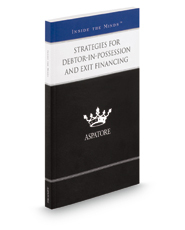 Strategies for Debtor-in-Possession and Exit Financing provides guidance on matters from the “loan to own” strategy, to the effect of the credit market, and the ongoing economic recovery on bankruptcy filings and funding. Private equity funds are supplanting banks as sources for money; bankruptcy cases and funding negotiations are moving more quickly; and restrictive covenants are showing up more and more often in agreements. In order to help their clients, lawyers must understand these new trends, as well as the general state of bankruptcy law and financing arrangements. Inside this book, you'll find tips on evaluating financing needs, seeking non-conventional funding options, and understanding industry-specific conditions. The expert authors also tackle recent caselaw and legislation, including the Bankruptcy Abuse Prevention and Consumer Protection Act and other aspects of the Bankruptcy Code. Both lawyers who specialize in bankruptcy and those whose regular clients find themselves in a debtor-in-possession case will benefit from the insights presented here.